Hello! And if you live anywhere that's been hit by the storm system that also hit my neck of the woods, welcome to winter. Winter is perfect for knitting, in my opinion, and I know that many Hugs readers are embarking on their Thanksgiving holidays which are if anything even more perfect. I mean, what better way is there to recover from shopping and turkey consumption? Over the next couple of days I have things to share that may help maximize any bonus knitting time, but today I want to show you a couple of sock things. 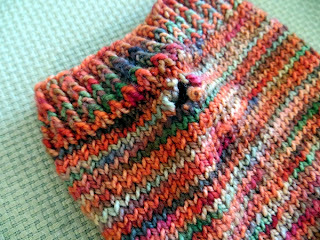 First off, here is a Vesper sock knit with 2.25mm round needles, lying on top of a Vesper sock knit with 2.5mm square ones. Isn't it amazing, the difference in width? 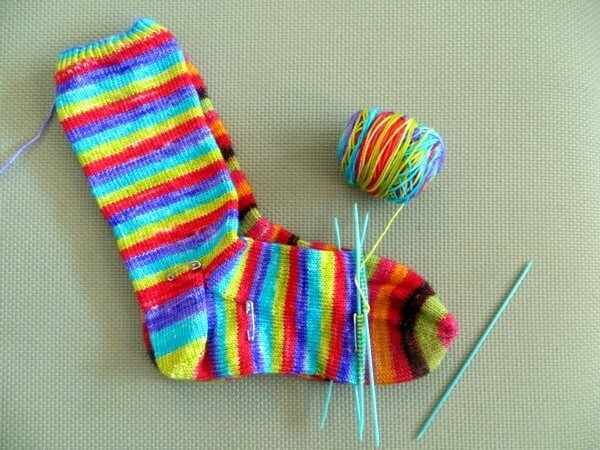 I mean, leaving out the lack of toe on the round needle sock (I'm getting there.) Square needles are a little smaller than the corresponding round version, and it's recommended that you go up a size especially if you are a tight knitter. I am a very relaxed knitter - in terms of my stitch size, obviously, not my temperament - and I still had to go up a size. 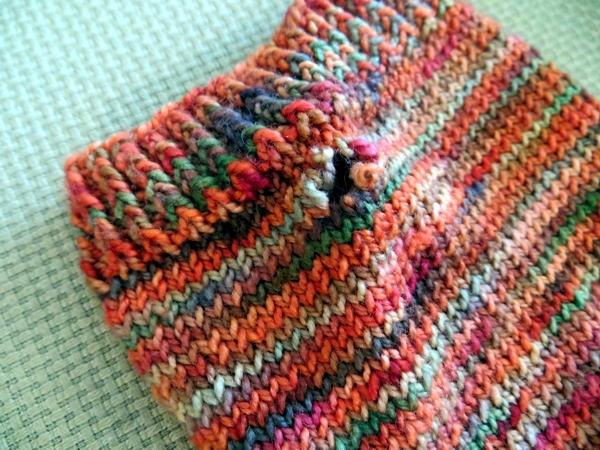 Looking at this picture reminds me why I am so much happier in my square needle socks - they are just so roomy and comfortable around the middle. The stitches are marginally larger and in theory are going to be subject to more abrasion, but in the year or so since I started using them I haven't had even a hint of a hole. Go squares! Ugh, so painful. It's got to be a moth hole really but there's just no evidence anywhere else of moth activity so I don't know. Maybe it got caught in something? For now: have a wonderful rest of the day and drive safe if you're going anywhere! I'll see you tomorrow with part one of some yummy weekend-y knitting stuff. 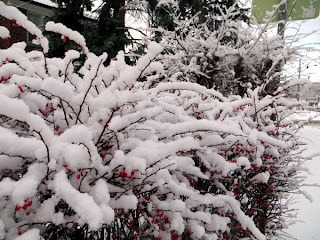 Your snowy photo is beautiful! Here in the states in my part of Georgia it tumbled to the upper 20s. I would love to be knitting on Thanksgiving Day, but I have to work!